Finish Line right now is having what it is calling its Semi Annual Sale. Semi Annual means around twice a year, I suppose. 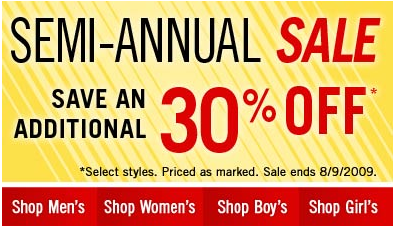 But whats important is that right now you can get great kicks with a 30% discount. Finish Line has some fresh shoes for all occasions. On sale are cleats, dress shoes, Air Jordan's, Timberland boots, and more. With Fall comes the new dress season including back-to-school. Don't get caught paying retail - check out their selection.